On Friday, more than 100 people were killed with more than 200 injured, in a well-coordinated attacks by seven gunmen on restaurants, concert hall and a sports stadium in Paris. 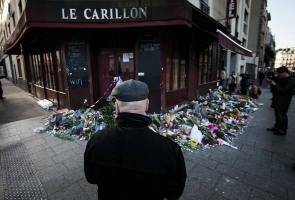 KUALA LUMPUR: No curfews have been imposed by the French authorities yet, in spite of the carnage that simultaneously struck Paris on Friday, said the Malaysian Embassy in Paris. However, the embassy on its website today reminded Malaysians to remain vigilant, take extra precautions, be aware of their surroundings, and follow the advice of local authorities. "The Embassy of Malaysia in Paris would like to inform Malaysians that no curfews have been imposed. Those in Paris are slowly returning to performing their daily activities. In doing so, it has become a common sight for boutiques and restaurants to continue operations and be frequented by customers. "However establishments administered by the Culture Ministry will remain closed this weekend along with shopping areas that attract large numbers of people. Athletic events are suspended today and tomorrow," the embassy said. Yesterday, it was reported that more than 100 people were killed, more than 200 injured, in a well-coordinated attacks by seven gunmen on restaurants, concert hall and a sports stadium in Paris. Following the massacre, which was said to be the worst, most horrific terrorist attacks in the country's history, the French President Francois Hollande announced a state of emergency immediately. "Following this directive, there is now increased presence of law enforcement officers and armed forces in France, particularly in Paris. Border controls have also been tightened. "Those concerned about family members or friends in Paris may contact the Embassy at the following numbers +336 3260 6184/ +331 4553 1185," the embassy said further.